A Duncan (Manager), J Spence, T Frame, J Moody, T Reid, T Manley, J Pullar (Trainer). 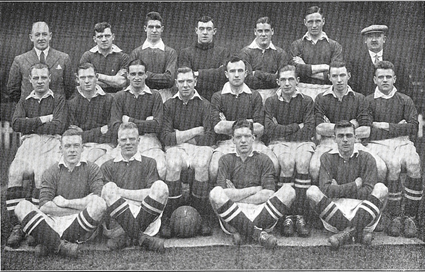 Middle row: W MacDonald, J Brown, S Chalmers, J Silcock, W Ridding, S Gallimore, A Warburton, G Fitton. Front row: J Mellor, E Vincent, H McLenahan, T Jones.